Size: 2.3" x 3.9" x 0.28"
The TI-1780 looks like a TI-1706 in a credit card format. You can't compare it with the stylish TI-1754 introduced some years before. 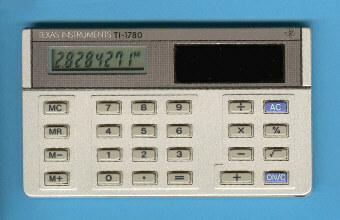 The inside view of this TI-1780 manufactured in September 1983 by Compal Electronics in Taiwan shows indeed similarities to the TI-1706 mentioned earlier. Later credit card sized calculators like the TI-1786 got an even simpler design. Don't miss the Casio FILM CARD SL-800, a real credit card sized calculator with a thickness of only 0.030". © Joerg Woerner, September 29, 2002. No reprints without written permission.